FAQ: How Long Should I Use Alpha-Stim, and When Should I Decrease Use? A frequently asked question about Alpha-Stim involves how long patients should use the device, and when they should (or can) decrease use. Everyone responds differently. 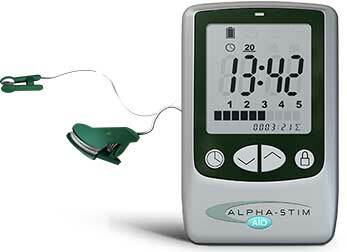 The typical Alpha-Stim protocol is designed to use it as little as possible while maintaining good results. Initially, you should treat at least once a day for about 3 weeks or until you start to feel balanced. Then you use it every other day to maintain results. Twice a week may be enough but if symptoms return, then add more treatments. You can also use it on an as-needed basis, as you cannot overdose on Alpha-Stim. Treatment can be done at any time of day. However, we do not recommend treating within 3 hours before going to bed as some people may be more alert after treatment. Other people can fall asleep with Alpha-Stim on. Unlike most prescription medications, Alpha-Stim has no risk of addiction or tolerance. People find that they can decrease use over time, as soon as they realize it takes fewer Alpha-Stim treatments to achieve the same effects. When using Alpha-Stim for pain management, acute and post-traumatic pain (including post-surgical pain) should be treated with AS-Trodes for at least an hour at a time but 24 hours is okay too. For longer lasting results try treating at 100 microamperes (1 on the display) if that is enough current to manage the pain. If not, raise the current as high as necessary. The highest current on the Alpha-Stim is still far less than any other brain stimulator on the market. More is not better when using Alpha-Stim! In some cases of chronic pain treating with the probes every other day is actually better than treating every day. If the pain gets worse initially that’s a good sign that the neuromuscular system is readjusting and balancing out. If it gets worse it will get better. Remember you are working towards a long-term management solution, not just 4-6 hours of relief. The best treatment strategy is the one that provides the most relief. Some experimentation is necessary. Each person’s comfort level can be different. To find your own personal level of comfort when using the ear clips for cranial electrotherapy stimulation, slowly increase the current until you feel a tingle/pulse, dizzy feeling, or floating motion, like you’re rocking on a boat. Then quickly press the decrease button once, wait a moment, then decrease it again until you don’t feel dizzy anymore. If treating at a level of 2.5 or above, you should treat for 20 minutes. Below this level, you should treat for 40 minutes, or 1 hour. Treat as often as necessary to get the best effects, but not more than that. Click here to view Alpha-Stim owner’s manuals and how-to videos, or read more FAQs.